Combine the blanched spinach, 2 minced garlic cloves, ½ tsp salt, and 1 tbsp sesame oil in a bowl. Mix well by hand and put it on a large platter with the sliced yellow pickled radish. Combine the carrots with ¼ tsp salt. Mix well and let it rest for 5 to 10 minutes. Heat a pan and add a few drops of vegetable oil. Squeeze out excess water from the carrots, then saute for about 1 minute. Put it on the platter next to the spinach. Crack 3 eggs in a bowl and add ¼ tsp salt. Beat with fork and remove the stringy chalaza. Drizzle a few drops of oil on a heated 25cm non-stick pan. Wipe off the excess with a paper towel so only a thin sheen of oil remains. Turn down the heat to low and pour the egg mixture into the pan. Spread it into a large circle so it fills the pan. When the bottom of the egg is cooked, flip it over with a spatula. Remove from the heat and let it cook slowly in the hot pan for about 5 mins, keeping the egg as yellow as possible, and not brown. Cut it into 2cm wide strips. Put it next to the spinach on the platter. Place freshly made rice in a large, shallow bowl. Gently mix in ½ tsp salt and 1 tbsp sesame oil with a rice scoop or a wooden spoon. Let it stand until it’s no longer steaming. Heat up a pan over medium high heat and cook the marinated beef, stirring it with a wooden spoon until well cooked. Place a sheet of gim on a bamboo mat with the shiny side down. Evenly spread about ¾ cup of cooked rice over it, leaving about 5cm uncovered on one side of the gim. Place beef, carrot, yellow pickled radish strip, a few egg strips, and spinach in the centre of the rice. Use both hands to roll the mat (along with gim and rice) over the fillings, so one edge of the rice and gim reaches the opposite edge. This centres the fillings in the roll, so they’ll be nicely in the middle when you slice it. 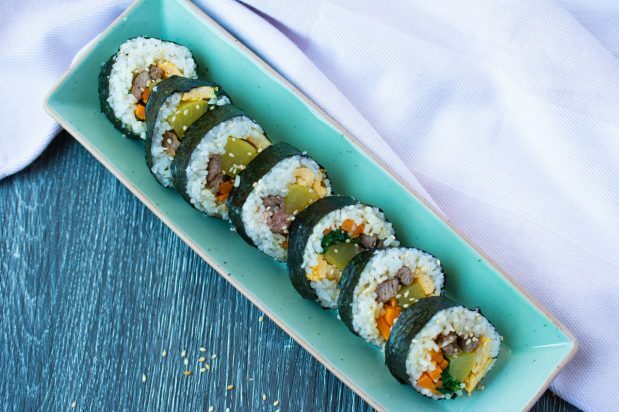 Grab the mat with both hands and press it tightly as you continue rolling the gimbap. Push out the mat as you roll, so it doesn’t get wrapped in the gimbap. Remove the roll from the mat at the end and set the finished roll aside with the seam down, to seal it nicely. Repeat 4 more times with the remaining ingredients. Put some sesame oil on the finished rolls and sprinkle some sesame seeds over the top. Cut each roll into 1cm bite size pieces with a sharp knife, occasionally wiping it with a wet paper towel or cloth to clean the starch off and to ease cutting. Put it on a plate and serve immediately or pack it in a lunchbox.